A 20 month old child, Opeyemi Ogundele was reported stolen on Sunday during a naming ceremony in Abeokuta. The News Agency of Nigeria (NAN) learnt that the incident happened at Mile 2, Iyana Concord, Akorede Estate, Ilugun Inukosegba Community in Abeokuta North Local Government Area of the state. Community members, however, besieged the residence of one Chief Olasile Ifayemi, an herbalist alleged to be the kidnapper of the child. Elizabeth Ogundele, 26, mother of the toddler, who narrated her ordeal, said she was getting ready for her niece’s naming ceremony when she discovered her son was missing. She said that she had gone to celebrate with her brother, Olusola Osunleke on Sunday when the incident happened. “I was helping my brother’s wife get ready for the ceremony when I noticed that my son was missing. “I searched for him in and around the house because some tenants said they saw him playing ball, but he was nowhere to be seen. “I ran outside the house into the community still searching and that was when I encountered two guys at Chief Ifayemi’s house. NAN reports that youths in the community vandalised the bungalow belonging to the alleged kidnapper. Different fetish items and human parts were discovered at the scene as angry youths were getting ready to set the bungalow ablaze. The head of the community could not be reached as at press time as he was not available. 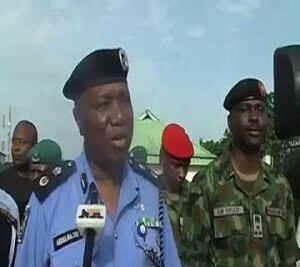 The Commissioner of Police, Abdulmajid Ali, who confirmed the incidence, said that investigations were ongoing. “Actually a two years old boy was kidnapped yesterday, but the site that was discovered has no relationship with the boy and other human parts that were found at the site. “Already, we have commenced investigation on the matter‎ and we will let you see what really happened when we finish our investigation. “I want to make it clear to the people of the state that I’m here to work and to reduce crime and criminality to the barest minimum. “We will not allow miscreants to continue to disturb us no matter their intention,” the police chief said.